“Called «The Pearl of West Indies», Haiti was during a long time the most visited country of the Greater Antilles representing the occidental third of Hispaniola Island. Devastated in 2010 by an earthquake measuring 7.0 on the Richter scale, the country has now to be rebuilt from new innovative architectural and town-planning concepts. The Coral Reef project plans a matrix to build a three dimensional and energy self-sufficient village from one and only standardised and prefabricated module in order to rehouse the refugees from such humanitarian catastrophes. This basic module is simply made of two passive houses (with metallic structure and tropical wood facades) interlocked in duplex around a transversal horizontal circulation linking every unit. Inspired from a Coral reef with fluid and organic shapes, the overall project presents itself as a great living structure made of two waves dedicated to accommodate more than one thousand Haitian families. These two inhabited waves undulate along the water on an artificial pier built on seismic piles in the Caribbean Sea. From concave curves to convex curves, the housing modules are aligned and piled up by successive stratums such as a great origami. Between the two inhabited waves is created a sumptuous interior canyon in pixels with terraces and cascades of food gardens. Actually, the laying-out in staggered rows of the plane-parallel base modules enables to superimpose the passive houses in cantilever and to multiply the vision axes towards an endless number of perspectives. Each roof of each module becomes then an organic suspended garden enabling to each Creole family to cultivate its own food and to use themselves their own wastage as compost. This canyon is a true tropical ecosystem for the local fauna and the flora. Ode to the urban biodiversity, it is also the central axis of the communitarian life of this futuristic village and respectful of its environment. Between the waves of these ecological housing, the sinuous lines of the anti-seismic basement (absorbing the vibrations in case of earthquake) integrate the public functions of the social life. Aquicultural farms welcome pisciculture pools whereas the purification plant lagoons recycle the used waters before rejecting them in the sea. The Master Plan can evolve and extends itself according to the «plug-in» principle. The urban framework of this ecological village remains thus undetermined, flexible and develops itself continuously according to the time and the space. New extension modules, also prefabricated in factory and brought by cargo will be actually added such as a giant meccano set to correspond to the needs of inhabitants completing the basic matrix. The visible sinuosity of this built landscape is structured by eight spine columns integrating all the vertical circulations linked together by two horizontal storeys crossing through a straight line the whole village from end to end. The whole set forms a compact orthogonal system that distributes all the flows through each module. The project is eco-designed and integrates all the bioclimatic systems as well as the renewable energies. Actually, the sea thermal energy conversion is made in the coverage of the pier by using the difference of temperature between the superficial waters and the deep waters. The kinetic energy from marine currents is converted by hydro-turbines under the pier into electrical energy; the sinusoidal pergolas on the roof attract the solar energy by photovoltaic panels and a park of spiral wind turbines is planted in the great tropical garden that covers the logistical basis. Taking advantage of the same natural and climatic conditions from the beginning as its neighbour island, Dominican Republic, Haiti is one of the countries that profits from one of the biggest potentials to reinvent a new sustainable urbanity and to implement the biggest challenges of reconstruction as a matter of urgency. The Coral Reef prototype project is in this context of humanitarian crisis a positive and dynamic answer fighting for the sustainable industrialised and standardised rebuilding of collective social housing of humanitarian and environmental high quality in disaster area. 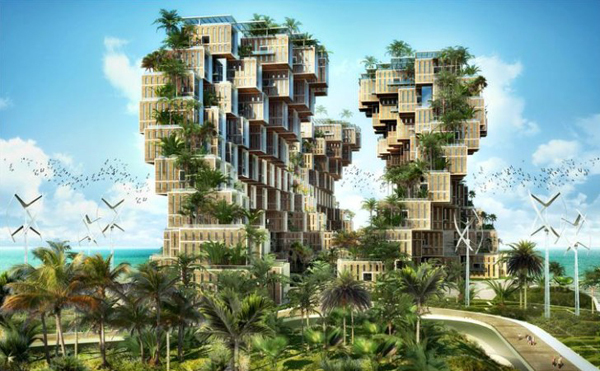 via Vincent Callebaut Architecte CORAL.